The host of Women Worldwide, Deirdre Breakenridge, welcomes her guest to the show, Kathy Caprino. Kathy is an International Career Success Consultant dedicated to the advancement of women in business. She is currently the Founder and President of Ellia Communications, after spending 18 years as a former corporate marketing VP. Kathy is also a trained psychotherapist, seasoned coach, and a much sought-after speaker. On the show, Kathy shares her how she reclaimed her life; a journey from corporate marketing executive to trained psychotherapist and career success coach for women in business. She details how any big transformation will uncover certain “blocks” or obstacles that you have to face head on, so they do not stop you from achieving your goals. Kathy discusses what it takes to move past these blocks, even if they are rooted in your childhood. She also offers great advice on the best ways to destress, energize and rejuvenate, so you can be more fully “present” in your life. 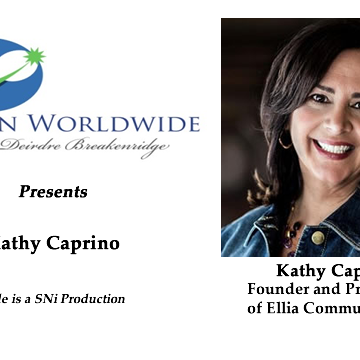 A little more about Kathy Caprino … As a Forbes, Huffington Post and popular blogger on career issues and trends, Kathy is a top media source on career and entrepreneurial issues. She has appeared in hundreds of leading newspapers, magazines and websites (including Wall Street Journal, USA Today, Chicago Tribune, Business Week, Forbes and more. Learn more about Kathy on her website and connect with her on Linkedin and Facebook.